The Colorado Rockies placed shortstop Troy Tulowitzki on the 15-day disabled list with a broken left wrist. They say Tulo will miss six to eight weeks with the injury. Experienced fantasy owners know that wrist injuries can linger and sap a players power months after they've returned to the playing field. But every player is different and Tulo owners should hope for the best as they prepare for the worst. 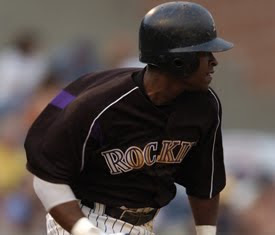 The Rockies have replaced Tulowitzki on the active roster with prospect Chris Nelson. Nelson has played well at Colorado Springs batting .311 with five home runs and 20 RBIs but Clint Barmes is expected to get most of the starts at shortstop with Melvin Mora and Jonathan Herrera competing with Nelson for playing time at second base. I suggest picking up Nelson in NL-only leagues. He many not receive many at-bats but he has the highest ceiling of the trio.